By participating in this competition, entrants agree to these rules. The competition is operated by Nestlé (South Africa) Proprietary Limited (“Nestlé”), who reserves the right in its sole discretion and to the extent permitted by law, to amend these rules at any time. This competition is run in conjunction with Nestlé’s agency, TMARC. These rules shall be governed by and interpreted according to the laws of the Republic of South Africa and any participant and Nestlé consent to the non-exclusive jurisdiction of the High Court of South Africa. The competition shall commence on 01 March 2018 and will end on 30 April 2018. No entries received after midnight on 30 April 2018 will be considered. Participants must purchase any qualifying Nestlé product during the promotional period. Thereafter the participant must dial the USSD code *120*832*and the last 4 digits of the qualifying product barcode followed by #. Participants will be required to answer 1 profiling question per interaction. Participants are required to note that USSD entries cost 20c for 20 seconds, and that free SMSes or minutes do not apply. In addition, participants are required to note that incomplete entries may be billed by their service provider, and that Nestlé shall not be responsible for telecommunication failure on the part of the participant’s service provider. These products may be purchased from any stockist nationally in South Africa. 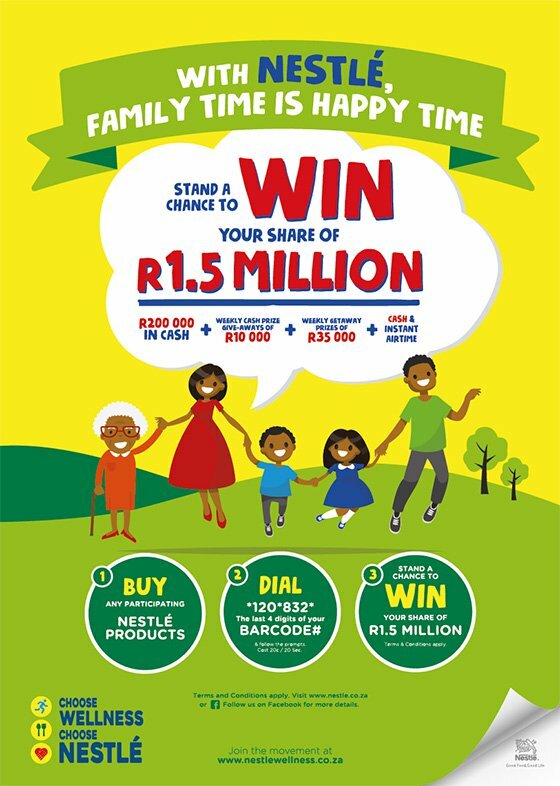 Please note that no other Nestlé South Africa products are eligible for this promotion, other than the products listed above. The qualifying products are subject to availability at time of purchase. 1 of 8 R35,000 Holiday Vouchers (valid for travel for a period of 3 years from date of issue of such vouchers). A travel agent will assist the voucher winners to book their holidays. Nestlé does not guarantee that the holiday voucher winners will obtain the required VISA for their choice of destination (if applicable). Holiday packages will be subject to availability at the time of booking. o 1 of 8 R35,000 Holiday Vouchers. Weekly Cash Prize Draws will take place from Monday 12th March 2018 and will conclude on Tuesday 01st May 2018. The Grand Cash Prize Draw will take place on Friday 04th May 2018. Weekly Holiday Voucher Draws will commence on Monday 12th March 2018 and will conclude on Tuesday 01st May 2018. The promoter or their agents will endeavour to contact the potential prize winners on the cellular number used to enter the competition. If, however, a potential prize winner cannot be reached after three attempts made within three working days of the promoter trying to contact that potential prize winner, the prize will be forfeited and another winner will be selected in accordance with the competition rules via a random draw. At the time that a potential prize winner is identified and contacted he/she will be requested to submit certain documents such as their original and unique proof of purchase (receipt/till slip), dated and timed before their entry date and time , and a copy of his/her ID document to the Nestlé representative upon request. The slip is not to be written on or tampered with in anyway. The potential prize winner is not an actual winner until his/her submission is validated and his/her documents are completed and submitted to the Nestlé representative. If a potential prize winner does not meet the eligibility requirements, the prize will be forfeited and another winner will be selected subject to the terms and conditions herein. The winner will be allowed 72 hours to provide the requested documents as listed above and any other item’s the promoter requests. Once verified the winner is to provide their preferred delivery address in writing (for weekdays only) or bank account details (as applicable). The promoter is not responsible for any unsuccessful delivery due to the incorrect delivery address being provided. Winners are to allow 15 working days for their prize delivery from when their proffered delivery address is confirmed. Any lost or damaged prizes once accepted and signed for will not be replaced. Winners are only eligible to win once in this competition. The results of the draw are final and no correspondence will be entered into. Nestlé and/or any of its agencies may refuse to award a prize to a participant if there is suspicion of any irregularities or fraudulent activities. Nestlé may require the winner to complete and submit an information disclosure agreement to enable Nestlé to ensure compliance with these rules. Should the winner be found to have not complied with these rules, he/she will automatically be disqualified and the prize will be forfeited. Winners may also be required to sign acceptance of prizes and indemnity documents. Winners may be requested to provide proof of repeat purchases if their entry volumes are seen to be excessive in amount, throughout the promotional period, as per the promoter’s discretion, as it is assumed that each entry is associated with a new product purchase. The prizes are not transferable, and no substitution or cash redemption of prizes is permitted, a prize will not be handed/awarded to a third party, but only to the verified prize winner. The winner will accept the prize as is, at their own risk. Nestlé reserves the right, at its sole discretion, to substitute a prize with any other prize of comparable or greater commercial value for whatever reason. The winners or participants may be required to take part in publicity campaigns for broadcast or publishing purposes. Winners or participants shall at all times be entitled to decline the above request. Winners or participants that take part in any publicity will not be entitled to any payment or other remuneration for such publicity or otherwise. All publicity and other materials will be the sole property of the promoter. All participants and winners indemnify the promoter, its associated companies (directors, officers and employees) and agents, against any/all claims for any accident, injury, harm, death, damages, costs and/or loss, whether direct, indirect, consequential or otherwise, arising from any cause whatsoever connected to or arising from their participation in any way in this competition and the redemption of any prizes. The promoter and its agencies reserve the right to correct any errors or omissions. These terms and conditions may be updated at any time as per the promoter’s discretion and will supersede any errors or omissions on any publicly communicated documentation or marketing material. For further information or enquiries or to obtain the list of winners after the competition, please email consumer.services@za.nestle.com or call us on 0860096116.